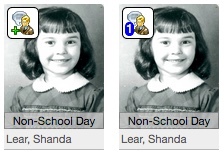 To access information specific to one student, click on the student’s picture. This opens the Student Detail options. Here you may email the family, access IEPs, look up specific health issues, get mailing addresses, find who the child may be released to, enter information when contacting the family, and more. Click here for the PDF created by 4J. There are two ways to document information about a student. Log Student Contact and Add Note. Notes can be entered into Log Student Contact by clicking on the student’s picture > Log Student Contact. These notes carry forward from year to year and those with TeacherVUE or StudentVUE access can read the notes. To access the Log Student Contact history, click student’s picture > Student > Contact Log tab. To use “Add Note,“ hover over the student’s picture in the seating chart. Click the icon that appears in the top left-hand corner of the picture. Enter the message. The note may be kept private. View this video for more information about adding a Note. Once saved, the icon indicates the number of notes entered for the day. To view previous notes, return to the Add Note screen and click on Show History. Notes do not carry over to future school years but can be accessed by changing the class focus to the year in which it was written.